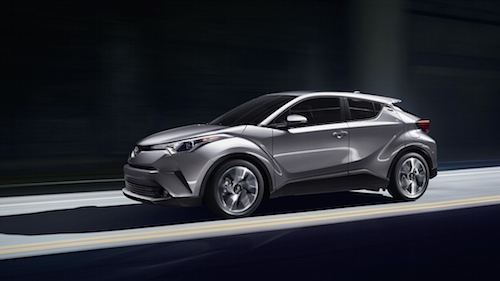 Meet the all-new Toyota C-HR in near Palm Springs, CA. Our dealership has taken delivery of the exiting new “Coupe High-Rider” model. This innovative new Toyota is generously equipped with standard features such as dual-zone climate control, supportive bucket seating, 7-inch audio display, 18-inch allow wheels and the Toyota Safety Sense system. The new Toyota C-HR is offered in a variety of exterior color options, including a variety of two-tone combinations. It is offered as either the XLE or XLE Premium model with a modest base MSRP. Our Toyota finance center is happy to explain your options for buying or leasing a new Toyota C-HR and can help you take advantage of current factory incentives or special offers. We invite you to explore all that this new model has to offer and take a test drive at our Toyota Dealership near Palm Springs, California. We invite you to stop by our showroom and test drive a Toyota CH-R near Palm Springs, California . Our team is on standby to answer your questions and help you get behind the wheel of your next vehicle.